How can the ECIDA help bring more Urban and Minority-Owned businesses to the economic development table? 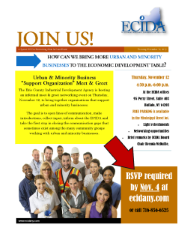 The ECIDA is hosting an Urban and Minority Business "Support Organizations" Meet & Greet Thursday, November 12 from 4:30pm-6:00 pm at our 4th Floor offices at 95 Perry Street, Buffalo NY 14203. Brief welcome by ECIDA Board Chair Brenda McDuffie at 5:30 p.m. Organizations like yours, which are focused on enriching urban and minority-owned businesses, are invited to share their wisdom, ask questions, and bridge the communication gaps among our community agencies. 1.) Other than finding funding, what is your biggest challenge when organizing community awareness efforts? 2.) What is the best way to effectively reach the community that your organization is most affiliated with? 3.) How much do you know about the ECIDA and what we do? Please feel free to forward this invitation to other organizations focused on helping urban and minority businesses succeed in Erie County!